As keen cyclists when we had a need to carry more than ourselves on our bikes we looked for the best solutions around and found that quick release bike trailers were a great option for carrying all sorts of items over long and short distances either on or off road. After trial and error we found the brands that work and last and what to avoid. When we had our first child it wasn’t long before we had her in a Burley Solo joining us on our favorite rides and trails around Christchurch and further abroad. When the second child arrived 18 months later there was no question that a Burley D’Lite would be needed so we could still bike together as a family. 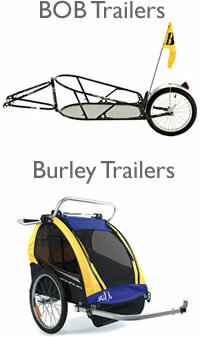 The safe and sturdy nature of the Burley child trailers gave us the confidence to continue to bike on the busy roads and the ride was so smooth often the kids slept for some or all of the ride. We are based in Christchurch which is perfect for cycling but if you live outside of this area we are happy to courier our trailers to you throughout New Zealand. The same team that run Bicycle Trailers NZ also run Natural High – Bicycle Rentals so you can try before you buy. Our Bob and Burley Trailers have circumnavigated New Zealand many times and are a great testament to the durability and versatility of these great products. ***AS SEEN BEHIND YOUR LOCAL POSTIE! – The Burley Nomad. Check out how NZ Posties power parcels with the Burley Nomad in Palmerston North. Give us a call on our 0800 444 144 freephone number and we can help you enjoy new cycling adventures! Bicycle Trailer NZ. 690a Harewood Road, Christchurch NZ.